If you’re up on your Greek myths – or your Ray Harryhausen fantasy epics – you’ll remember that Medusa was the legendary guardian of the Underworld, a fearsome monster made up of half-woman, half serpent, with snakes for hair and a gaze that could turn even the most buffed of heroes into stone. 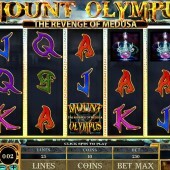 Prolific slot developer Microgaming’s 5 reel, 25 pay-line slot, Mount Olympus – Revenge of Medusa – sees the snake-haired mother-in-law from Hell do battle with the heroes of Olympus once more in a slot packed with bonus features. Now, if you are like me then you will have loved growing up watching things like Jason and the Argonauts and Clash of the Titans. If you did, then you will want to check this slot out. As we start the game, a suitably atmospheric soundtrack plays over the top and some nice claps of thunder announce themselves in the background as rain drips down the screen. Medusa is the top paying symbol, with five Medusas playing out a 1,000 coin jackpot. Elsewhere on the reels there are magic eyes, swords, and magic vials, with the 9-through-Ace symbols making up the reels. Betting, as is customary with many Microgaming slots, caters for slots fans of all wallets, and a maximum bet of $250 a spin is possible. The Wild icon is the, er, Wild icon, substituting for all regular symbols other than the Scatters. There’s the usual 2x multiplier applied to all Wild wins. 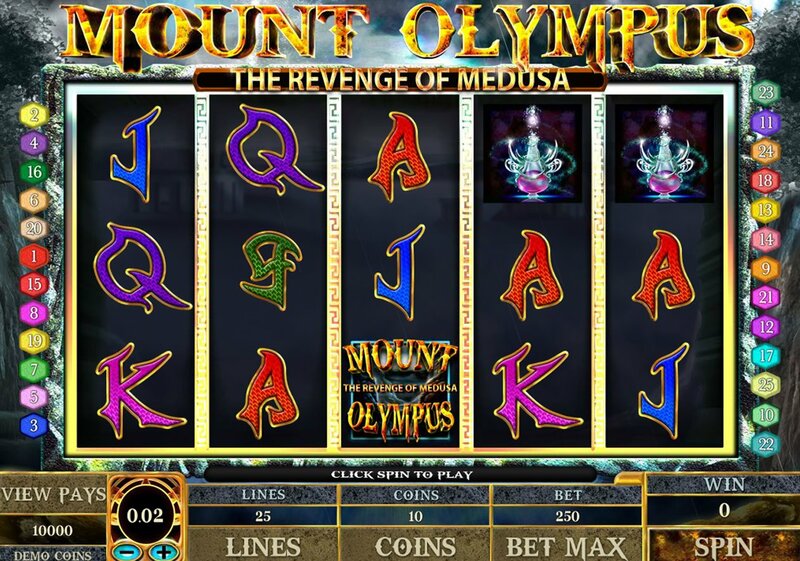 Hitting three to five Scattered Mount Olympus logos anywhere on the reels triggers the Revenge of Medusa Free Spins Bonus. Players are awarded 5 free spins to start off with but during every free spin, Medusa will present the player with five snakes to choose from. The chosen snake will reveal how many reels Medusa freezes and turns into a Wild reel. Anything from one to four reels can turn Wild during free spins, but the feature is restricted to reels 2-5. When it comes to atmosphere and slick graphics, you can’t go far wrong with Microgaming’s slice of Greek myth. Orion – the myth-based slot from the same developer – is a perfectly adequate alternative, but if you’re after a slot with more bonus for its bite, Bally's legend-themed Cupid and Psyche gives both games a run for their money.